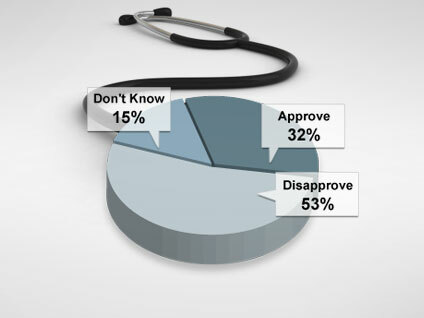 The public is increasingly skeptical of the health care reform bill signed into law last week, a new CBS News poll shows. More Americans now disapprove of the legislation, and many expect their costs to rise and the quality of their care to worsen; few expect the reforms to help them. President Obama has continued to tour the country to stump for his new set of reforms. This week he went to Portland, Maine, where he told people it will take more than a week for the benefits of reform to become apparent. The poll, conducted March 29 through April 1, found that so far the president's efforts to build up support for the bill appear to be ineffective. Fifty-three percent of Americans say they disapprove of the new reforms, including 39 percent who say they disapprove strongly. In the days before the bill passed the House, 37 percent said they approved and 48 percent disapproved. Republicans and independents remain opposed to the reforms, and support has dropped some among Democrats. Now 52 percent of Democrats approve of the new reforms, a drop from 60 percent just before the bill was passed by Congress. And less than one in five Americans thinks the new health care reforms will help them personally - unchanged since before the vote in Congress. Thirty-six percent think the new reforms will hurt them, while 39 percent think they will have little effect. There are also some doubts about the specific ways in which Americans expect the reforms will affect them. Just over half think the new health care reforms will increase their health care costs, and 39 percent think the quality of their health care will get worse. Even though the president and Democratic leaders have repeatedly pointed out that the nonpartisan Congressional Budget Office called the reform package a deficit-reducer, six in 10 Americans still think the new health care reforms will increase the budget deficit. Just 13 percent think the reforms will decrease the deficit and another 15 percent expect no effect. But Americans are relatively more positive about one outcome of the legislation -- the effect the new reforms will have on consumers and the health insurance industry. Thirty-five percent think the reforms will increase consumer protection against health insurance companies, and just 20 percent expect that to decrease. Still, as was the case before the bill was passed, about half of Americans say they don't have a good understanding of how the new reforms will affect them and their family. Fifty-three percent find the reforms confusing, and just 41 percent understand their impact. Only 34 percent of Americans approved of the president's handling of health care -- an all-time low. Mr. Obama's overall approval rating also hit an all-time low in this poll at 44 percent, as Americans continue to worry about the economy. The public's approval of Congress also remains low at 16 percent. The lead-up to the House vote on health care reform was contentious, and 56 percent of Americans believe Congress' behavior is less civil now than it was 10 years ago. Democrats, Republicans and independents all share that view. On a completely different note, the poll also asked respondents about their opinions of people using swear words -- which has been in the news recently. When it comes to cursing, a third says they are bothered a lot by people using swear words in conversations -- but 38 percent aren't bothered much at all. Women dislike it more than men. This poll was conducted among a random sample of 858 adults nationwide, interviewed by telephone March 29-April 1, 2010. Phone numbers were dialed from random digit dial samples of both standard land-line and cell phones. The error due to sampling for results based on the entire sample could be plus or minus three percentage points. The error for subgroups is higher. This poll release conforms to the Standards of Disclosure of the National Council on Public Polls.